Let loose—let your hair down! Fueled by fiery Mars (amplifying passion and emotion), I hereby declare the entire week of this Full Moon to be FUN CITY. On March 8 (1:39 am Pacific; more time zones here), the Full Moon is at 18° Virgo. This Full Moon coincides with Holi, a traditional holiday celebrated in India (and beyond) known as the Festival of Colors, Holi begins with a bonfire on the eve of the Full Moon. And then, the next day all H--- Breaks Loose. I was traveling through rural India one year on Holi; I’ve never seen anything like it. People swarm the streets and toss brightly colored powders and paint at one another! Everybody is covered head-to-toe in color. There’s also music and dancing, and all manner of outrageous entertainment too. But the real stand-out is those brightly colored powders and paint. Clothing gets soaked and faces are smeared with raucous reds, brilliant blues, every color imaginable. Wild! History, on the other hand, paints a much different picture. 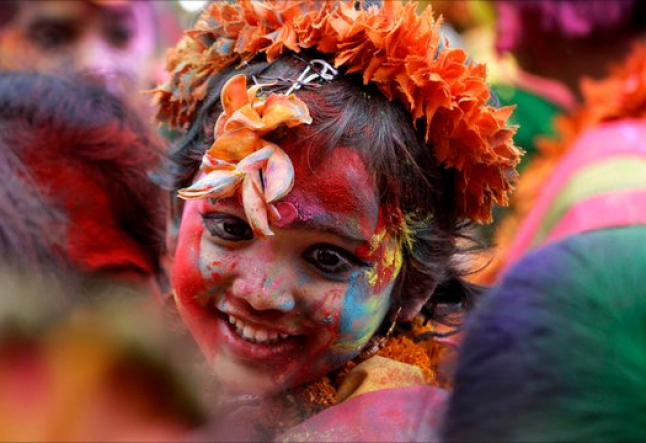 In earlier times, Holi was a simple springtime festival, a time to commemorate fertile lands. Which leads us to the topic of Virgo. Virgo is an Earth sign; and by mid-March this year, all three Earth signs interface in this highly charmed aspect called a Grand Trine (Virgo/Mars, trine Capricorn/Pluto, trine Taurus/Jupiter). This aspect can open doors for everyone. Earth sign Grand Trines are said to initiate true abundance that can raise our standard of living for the rest of our lives. Don’t miss this opportunity. Make it work for you. The Full Moon is in Virgo, a sign symbolized by a virgin goddess holding a sheaf of grain. I'm a Virgo, and that Virgoan symbol always makes me think of my childhood. I grew up in Montana, amidst farmlands and fields that kept everyone well nourished with fresh produce—circling back once again to Virgo (and the traditional body-zodiac correlation for this Full Moon): Virgo = abdomen, and the digestive tract. • The first part (most of us have no trouble here): eating yummy, prana-rich food. • The second part—surrender. Release. Letting go. Um, easy, right? Truth is, we could all learn a thing or two about surrender. Cutting loose. And that liberating act known as letting go. I love twisting poses. Twists wring out the toxins and leave us feeling squeaky-clean and refreshed. Try this simple seated twist (you can even do this one at your desk). • Sit in a chair (or on the floor in Sukhasana, easy cross-legged pose) and plant both sit-bones firmly. • Cross left arm in front of the torso—left hand to right knee. • Inhale, elongate spine up. • Exhale and twist mid-to-upper abdomen (mid-section of the torso) to the right. • Exhale—relax into your most delicious twist. • Take a deep inhale, and on the exhale release the twist—return to center, pause, breathe, and soak up some bliss. The blissful sensations arise whenever Ida and Pingala nadis (subtle-body energy channels, on either side of the Sushumna nadi in the spine) cross one another. Twists bring about a sense of ease and surrender. Works every time. Let's cut loose and savor the flavor of this Full Moon. Do blissful twists. Enjoy vivid colors. Walk outside and gaze up at the beautiful Moon. And take pleasure in every bite of delicious prana-rich food too. May the Grand Trine shine its rich blessings on you. Namasté.